Democracy is more than just holding elections. Democracy is ensuring that young people and their communities understand, exercise and uphold their civic rights and responsibilities. Since the unfolding of the Arab Spring in 2011, many have identified Sub-Saharan Africa as the next location for political uprisings, a response to the increasing number of educated youth confronted with rising unemployment and the absence of political space. The youth “bulge” in Africa presents myriad reasons for concern. Youth militias in Sierra Leone, political violence led by youth in Kenya, the exploitation by political and military elites of young people in Liberia and Rwanda and the constant upheavals of Islamist extremist group Boko Haram in Nigeria remind us of the negative impact large youth populations can have in African countries. The Arab Spring has been a costly reaction to the exclusion of educated youth from labor markets and political decision-making. Excluding youth from formal decision-making is likely to create significant frustration and have a destabilizing effect on democratization in countries where youth-led protests have contributed to forcing authoritarian regimes from power. Nigeria is plagued with ineffective institutions and infrastructure, high-profile corruption, poor education, unemployment and poverty. SDG goals have not progressed. The country is low on accountability and high on problems—unpaved roads, poor water quality, unsanitary conditions, inadequate power, disease, malnutrition, poor education and high levels of unemployment are a few of the issues Nigeria faces. While the number of out-of-school youth is declining worldwide, it is increasing in Nigeria. In fact, Nigeria has the highest rate in the world. Out of a school-age population of 57.4 million, at least 10.5 million are out-of-school. Primary school enrollment is at 85%, and only 59.5% attend. Only 43.8% are enrolled in secondary school. All these numbers get worse for rural youth, only 52% of whom attend school overall, compared to 71% of their urban counterparts. 40% of street children and hawkers are trafficked persons. Armed youth in oil-producing states are in militia groups involved in high-profile kidnappings, intimidation, violence, and rigging. At 2 million, Nigeria has the 8th highest number of displaced persons in the world due to conflict and violence. Due to government ineptitude, Nigeria’s 34 million youth are economically, socially and politically deprived. And yet, by 2050, Nigeria will have the 5th largest number of youth ages 0-19 in the world. These worsening conditions hinder youth opportunities and prevent them from being able to demand better services. It erodes confidence that they have the ability to make demands at all. 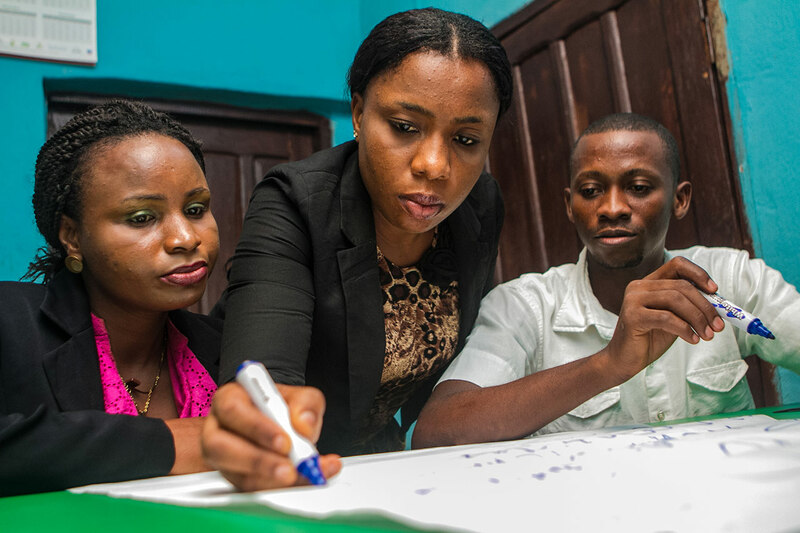 Nigerian youth experienced peaceful elections for the very first time in 2015. Youth have historically been “employed” as thugs in political rigging, assassinations and violence—this has especially been the case for those not in school. As Africa experiences more unrest due to political inaction, these restive youth are more likely to participate in violent uprisings. Instead of violence, Nigerian youth need to understand their civil role so they can peaceably participate in political action and accountability. Teaching them about that role is a key objective of PeaceOpoly.